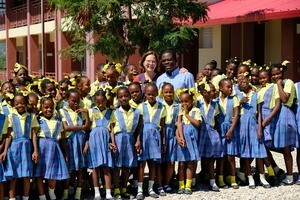 A few weeks ago, I walked through the doors of the Father Jeri School for the first time since it opened. To say I felt overwhelmed with joy would be an understatement. It was everything I imagined and so much more. I arrived during lunchtime and the sounds of children playing outside and eating in the cafeteria filled the air. As I stood in the courtyard taking it all in, I remembered back to when the school was just an idea that seemed almost impossible to bring into form. But here it was in front of me. Alive and vibrant. Three stories full of eager students. 351 of them! Pre-kindergarten through 12th grade. 8 full-time teachers, 39 subject specific part-time teachers, and 23 staff members. Everyone engaged in their work. And food program meals streaming into the cafeteria with hundreds more plates prepared for other hungry children in the neighborhood. So much going on. So much energy. So much school spirit. I visited chemistry, math, and history classes, enjoyed the enthusiastic singing of the kindergarten children, and watched students practice their dance routine for Haiti’s Flag Day. Every inch of the school was being used and enjoyed. 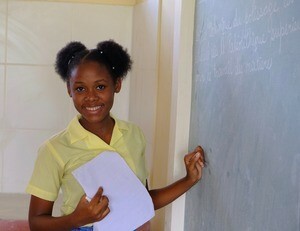 Even on the weekends, classrooms are filled with students participating in Na Rive’s after-school program. It was palpable how cherished the Father Jeri School is, how proud the students are to be a part of it, and what an invaluable resource it is for the community. 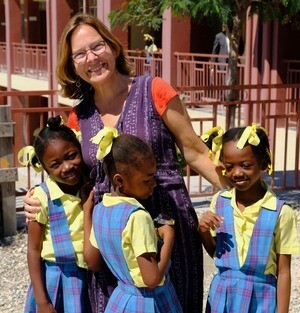 The school is changing lives, providing hope, making a difference every day. Throughout my trip, I kept thinking of you and how you’ve helped make all of this possible. Without your support, this school would have remained just a good idea. Your donations pay for scholarships, teachers, books, and uniforms. They pay for fuel to keep the generator running and food program stoves burning. And meals – you pay for hundreds and hundreds of nutritious meals every day that mean everything to a hungry child. Every donation of every size matters in this work. I’ve been thinking a lot about what it takes to move an idea into reality. It takes all of us: Our extraordinary partner Na Rive, our devoted staff and board at What If Foundation, and every one of you. It’s all of us sharing our hearts and resources, being vehicles of love, united in our desire to make a difference for some of the world’s most vulnerable children. I feel so grateful to be part of this tangible and transformative work. Thank you for being a part of it too and for your ongoing support of the What If? Foundation. 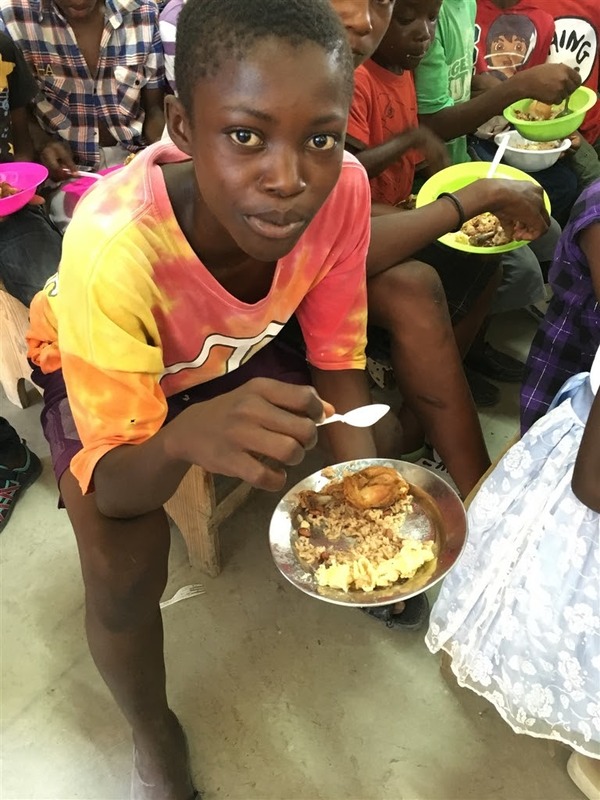 This entry was posted in Education, Engaged Buddhism, Food security, Projects & programs and tagged Children's hunger, Engaged Buddhism, Father Jeri School, Haiti, What If Foundation. Bookmark the permalink.